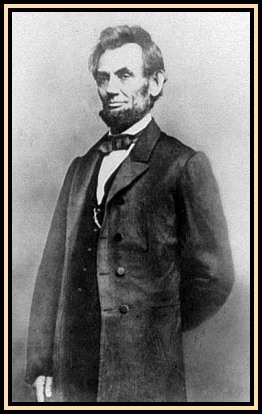 Abraham Lincoln was a great president---whether or not you agree with all of his actions---and any clumsy attempt by me to write his biography would be an insult not only to him but also to the many biographers, good and bad, who have already done that. Accordingly, this section on Abraham Lincoln will dedicate itself to providing items about Mr. Lincoln and the Civil War that I find interesting. There is no agenda or opinion hidden in this section. I have a separate section specifically for my Opinions and I do my best to insure that it does not bleed over into other sections on this site. If you feel that I have not met this objective, I trust that you will tell me. Anyhow, welcome to the Abraham Lincoln section on this site. I hope you enjoy it! "...Any people anywhere, being inclined and having the power, have the right to rise up, and shake off the existing government, and form a new one that suits them better-- This is a most valuable, -- a most sacred right -- a right, which we hope and belive, is to liberate the world--Nor is this right confined to cases in which the whole people of an existing government, may choose to exercise it--Any portion of the such people of an existing government that can may revolutionize, and make their own, of so much of the teritory as they inhabit--More than this, a majority of any portion of the such people of an existing government,-- may revolutionize, putting down a minority, intermingled with, or near about them, who may oppose their movement--Such minority, was precisely the case, of the tories of our own revolution--It is not the qual a quality of revolutions, not to go by old lines, or old laws; but to break up both, and make new ones--..."
Copyright 2010 - 2012 by USACivilWar.com.